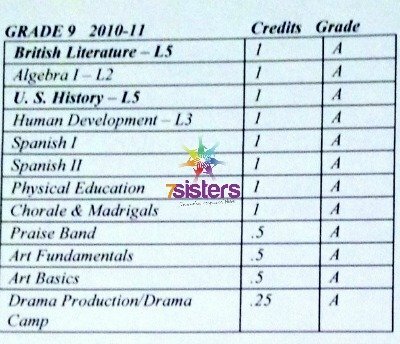 Why should homeschool high school transcripts include recording of course levels? You can see the level or phase should be noted on the transcript beside the course title. Note: There is not much standardization of levels from school to school. The homeschool umbrella school that our families belong to requires levels that are much more robust than many schools. However, their reputation for high standards has opened doors for our students to many colleges. Here is how our umbrella school assigns levels. Adapt it in a way that fits your family. This level is for students who struggle in a subject. While it is acceptable for high school graduation, Remedial Courses are not acceptable for college applicants. This level is for average high school students. While Level 2 Courses are not as rigorous as Level 3- College Prep courses, taking a Level 2 course does not prevent a student from going to college. 7Sisters World Literature, like all our curriculum is adaptable to various levels. The texts include instructions on how to add or subtract learning activities and assignments to allow academic success for average to honors students. This level is for students who are certain they are going to college. These courses mimic the rigor of college classes. This level is for students in College Prep courses who are able to do more rigorous work. These courses add power to the transcript and are attractive to colleges. Level 4 at our umbrella school requires Level 3 work plus 1/2 more credit to equal 1 advanced credit. This level is for highly competitive students who want the most powerful transcripts. These courses look very attractive to colleges but are very rigorous. Level 5 at our umbrella school requires fully double the work of a Level 3 course or an AP course. 7Sisters Psychology course has instructions for going deep in interesting and life-skills-useful ways to earn a powerful Honors credit. I’ve homeschooled each of my 5 kids all the way through high school. They have all attended (or are attending) the colleges of their choice. The clarity of levels on their high school transcript has helped the admissions process. Click here to learn about figuring out GPA for the transcript. Click here to read more about the importance of rigor and extracurriculars on the transcript.